You hear a lot of talk these days of the desire for Christ to build His kingdom here. But I believe it has just become a shallow proclamation and just a phrase christians say and do not know what it really means. Stumbling blocks are stacking up on each other around every corner and it looks as if this world has no hope. This culture seems to be the most godless in modern history and the church idly sits by fighting battles, that are rooted in spirituality, with carnal weapons while it happens. The church should stop pretending it has any significant influence on today’s culture. Mostly because the modern church looks and acts more like a political party or lobby group than it does a divinely led institution. Instead of showing love in situations we sputter out party talking points or regurgitate political rhetoric we have learned from our favorite talking head. Far too often ministers are calling for more political action than they are for corporate prayer. 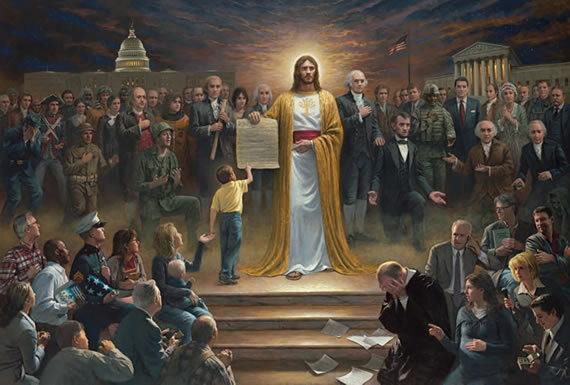 But Jesus never encouraged legislative means for a Godly end. You never saw an instance in scripture where the apostles picketed, boycotted, campaigned against (or for) the folly of the Roman government; even under bitter persecution. It seems Christians enthusiastically support almost every government mandate from wars to social engineering, especially under a Republican administration. The calls from pulpits for soldiers to invade the Middle-East are louder than the calls for missionaries to go. But the United States military is not God’s army and the President, regardless of party affiliation, is not God’s general. At election time you see ministers very publicly endorsing their candidate of choice regardless of the candidates voting record, religion, or moral failures. It seems many pastors today are pimps, whoring out the church to a political party or pet cause. The church is seen by the non-Christians as just a voting block or a Political Action Commitee. The sad reality is you will NEVER legislate your idea of morality or boycott someone into Heaven. We are failing future generations by being known more for what we hate than what we love, and being known more for what we are against than we are for. “Heavenly places” occurs five times in the book of Ephesians. He has called us to heavenly places far above the things of this world. Ephesians 2:6 says, “And hath raised us up together, and made us sit together in heavenly places in Christ Jesus.” The death of Jesus is the death of our old nature. Christ’s resurrection is our resurrection and His ascension is our legal access to heavenly places! We should be invading this culture with a standard of holiness. We should not try and achieve Godly ends through worldly means. We are so quick to support knee-jerk reactions to situations that can only be dealt with by the Holy Spirit through prayer. Jesus Christ gives us our blueprint of prayer in Matthew with the Lord’s prayer. He begins with “Your Kingdom Come.” We are to begin our prayers by acknowledging His will…not with self indulgence and selfish desires. If we desire His kingdom here then His kingdom business should be a way of life. We should be dwelling in heavenly places and projecting His kingdom from there to here. We should be foreigners invading the culture, but, more often times than not, the culture has invaded the church. It appears we are losing a battle that has already been won. Your kingdom come oh Lord!